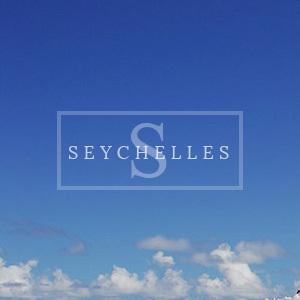 Four Seasons Resort Seychelles is a remote, hillside retreat that embraces the natural simplicity of treetop living. It covers a secluded area of 170 acres on the southwest coast of Mahe, and comprises 67 villas and suites, and 29 Four Seasons Residences that descend down a lushly forested incline to the private, horseshoe beach of Petite Anse. Creole-inspired design complements the dramatic topography, with granite boulders lining the powder-white beach, steep jungle slopes and a shoreline indented with ancient pirate coves. Recreation abounds at Four Seasons Resort Seychelles - from the outdoor swimming pool and water sports pavilion to the fitness center, library and art gallery. Land and sea activities are available for both the adventurous and the leisure-minded - with every detail coordinated by the multilingual Four Seasons concierge staff. 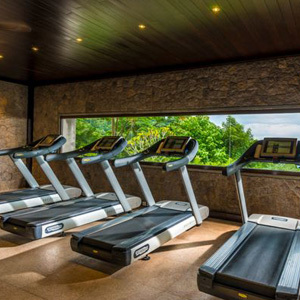 The Fitness Center offers a selection of state-of-the-art Technogym equipment, each machine with its own television and headset for private entertainment. Complimentary exercise wear is offered, including shorts, shirts, gym shoes and socks. Personal training with certified trainers is available by reservation. The secluded, horse-shoe beach that lies at the foot of Four Seasons Resort Seychelles is one of the island's best-kept secrets. Black granite boulders provide a dramatic backdrop to the powder-white sand and azure waters of the secluded cove. The bay is sheltered by dense vegetation and protected by an outer reef; as a result, the water is extremely calm, making it ideal for swimming and safe for families. Due to its protected position, the beach is remarkably free from erosion, maximizing its picture-perfect appeal. The water-sports pavilion houses its own PADI dive center, offering scuba diving with state-of-the-art equipment and certified instructors, as well as snorkeling equipment and excursions. Please note that to preserve the serenity of Petite Anse bay, motorized watersports are only available off-site, by prior arrangement. The Resort's complimentary Kids For All Seasons Programme caters to children from "potty-trained" to 12 years old, from 9am to 5pm daily. It has its own 'play and spray pool' and dedicated 'Kids Club Kaz'. Caring and experienced staff co-ordinate a variety of fun and educational experiences, including beach and outdoor activities, creative crafts and games. The Library is set in its own 56 sqm pavilion, where guests can lounge with a collection of contemporary books and magazines, including guidebooks about Seychelles and Creole culture. A flat-screen television is available, along with complimentary high-speed Internet access at two workstations with desktop personal computers and color-printing access. A wide selection of complimentary DVDs, CDs and books is available for guests to enjoy in the Library or borrow to use in their villa. The Resort has its own 200 sqm Art Gallery, which showcases local art and sculpture. The Resort has two stylish boutiques: an exclusive jewelers offering an elegant range of diamond and pearl jewelry and the Four Seasons Shop, featuring a high quality range of handbags, clothing and shoes, gifts sundries and souvenirs. The Spa at Four Seasons Resort Seychelles epitomizes the sense of natural beauty, tranquility and seclusion found throughout the Resort. It is located at the top of the hill with spectacular views over the Petite Anse bay and the Indian Ocean beyond. International treatments are enhanced by indigenous practices, local ingredients and breathtaking views; the result is a rejuvenating and holistic experience that showcases the island's most inspiring features. Five spa pavilions accommodate a total of five double and three single treatment rooms, each with beautiful Indian Ocean views. Each double room is equipped with changing facilities, two indoor massage beds, outdoor bathtub, rainshower and toilet. The single rooms include a changing area and toilet. The main spa pavilion houses the reception, consultancy / waiting area, retail shop, juice bar, and relaxation lounge. The Hair Salon and separate treatment rooms for facials, manicures and waxing are located on the Spa's lower level. The Spa features treatments that are traditionally Seychellois and use fusion techniques from India alongside other Asian traditions. Many of the treatments incorporate island herbs and spices such as cinnamon, frangipani and lemongrass, combined in accordance with ancient recipes. Massages, body scrubs & wraps, facials, hydrotherapy baths, and foot & hand treatments are offered in harmony with island traditions. In addition, spa rituals incorporate herbal tonics and organic teas from the island and - in the case of specialty packages - personalized spa cuisine. A timber deck connects the Spa to a yoga pavilion, available from sunrise to sunset for private instruction or individual yoga sessions. Yoga mats, straps, blocks, towels and water are all provided. The Spa's yoga and meditation activities are all designed to balance energy centers and bring about harmony and peace, while educational workshops and retreat programmes emphasize local herbal traditions and cultural nuances. The Spa features a dedicated Junior Spa Menu, showcasing natural ingredients and a gentle approach to help guests as young as 6 to develop an early understanding of holistic healing. Massage treatments are also available in the privacy of your villa.